The long-awaited version of the DreamWear Mask is now available for mouth breathers, and there is also some compatibility with the parts of the DreamWear Nasal Mask, should a person occasionally need to switch over from nasal to full face and vice versa. 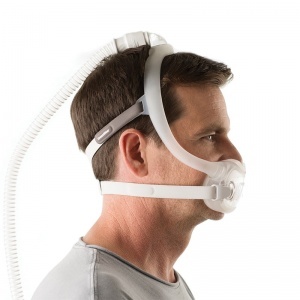 This is the new version of the DreamWear Mask which is suitable for mouth breathers, who can now benefit from the great features the original DreamWear brought to the market, such has having the hose connected at the top of the head rather than hanging below the mask. 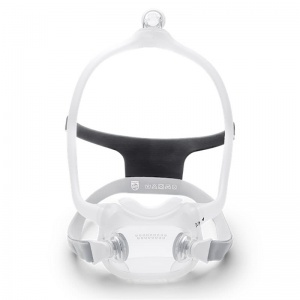 Philips Respironics describe it as "like wearing nothing at all" and certainly compared to full face masks in general, it really is a light-weight mask. Amazed at how quiet the mask is when a good seal is achieved, even at higher pressures on non-invasive ventilators. Love the way the hose connects at the top of the head, and is a perfect match for people who use the popular Hose Lift as it allows most of the hose tubing to be completely out of the way. There are 3 sizes of mask frames and 4 sizes of cushions, so it is expected a combination of these should fit most people - if not all. A good choice for people who struggle with nasal bridge sores, as this mask goes nowhere near that area. Also this style of mask can help people with a receding jaw as it can often be difficult getting a traditional full face mask to fit correctly both at the nose bridge area and the chin. The magnetic fasteners work well, but please read the 'Important Notes' at the bottom if you have any devices such as a pacemaker or cochlear implants etc. 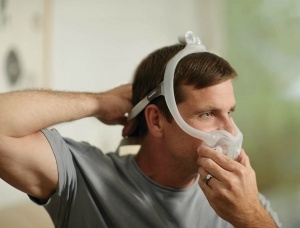 A huge benefit for some people is that the frame of this mask can be used with the nasal cushions of the original DreamWear Nasal mask, so for people who don't need a full face mask all the time it is easy to detach the mouth cushion and replace it with the new gel nasal pillows or the nasal cushion. However, the headgear is not the same on both masks, so a separate DreamWear Nasal Headgear will be needed for using it with the pillows or nasal cushion, but this will still make it cheaper than purchasing a separate mask. 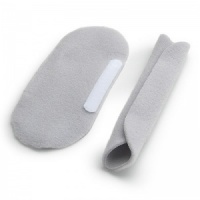 The cushion is very soft, both around the mouth and where the nose inserts into the hole. However, for people who still like or need a mask liner, there is now a version of the Silent Night Liners that fits both the DreamWear Full Face and the Amara View Full Face masks. This is another welcome full face mask for people who like to wear reading glasses in bed, which is impossible with some of the traditional styles. "Like wearing nothing at all. 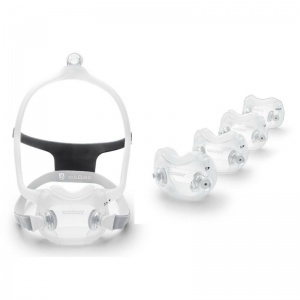 By moving the tube location to the top of the head, DreamWear Full Face offers more freedom of movement during the night. Users stated they didn't need to choose a sleeping position when wearing DreamWear Full Face. 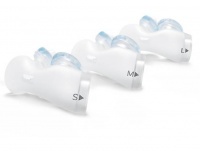 The under-the-nose, innovative design of the cushion means no more red marks, discomfort and irritation on the nose bridge. Open design makes it easy to wear glasses, read, watch TV and use a computer or tablet before falling asleep. The soft, flexible frame is comfortable to wear at night. Users have said that it feels like wearing nothing at all. Only a few parts for easy assembly, disassembly and cleaning. The headgear clips and mask cushion contain magnets" (please see 'Important Notes' below). There are 2 options for purchase - you can either select the FitPack which contains all the mask cushions to ensure you obtain the correct size, or if you're confident of what size you require you can simply purchase the size of cushion you require. Some medical devices may be affected by magnetic fields. 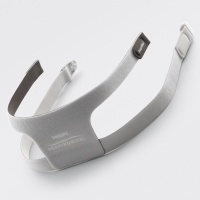 The magnetic clips in this mask should be kept at least 50 mm (2 inches) away from any active medical device with special attention to implanted devices, such as pacemakers, defibrillators and cochlear implants. The mask will continue to provide the prescribed therapy. Every other mask on the market operates with one tube running to the cushion and this mask operates in the same way. No increase of pressure or noise will occur. 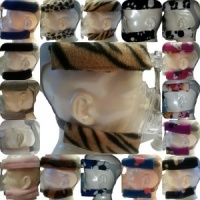 With the tubing right next to the ear, will DreamWear Full Face be noisier than other masks? 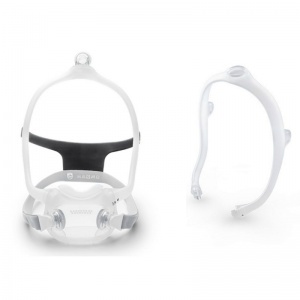 From a sound level perspective, the DreamWear Full Face mask is a quiet full face mask. However, since the airflow is located closer to the ears with this design and not routing downward in front of the patient, some people may notice the airflow noise more than a traditional mask. For most patients the experience is quiet and comfortable with the unique design offering more freedom of movement. However, since this is such a different design, it may take some people some time to get use to the difference in the noise. It’s not louder - simply different. (We at Hope2Sleep noticed the 1st night of use the mask did sound louder, but it was not noticed after that 1st night). There are 3 sizes of frames. How do I choose the right size? Always start with the medium frame. If the mask is too small, the frame will sit too close to the eyes. If the mask is too big, it will sit too close to the ears. Please refer to the quick start guide or instructions manual for pictures and a thorough description. In most cases, it will be obvious if a different size frame is needed. However, if there are leaks at night or the mask seems to move too much, a different size frame and/or cushion should be tried. If you remove the headgear, cushion and swivel, the frame is essentially one tube. This can be cleaned the same way the short tubing on other masks or the longer CPAP tubing is cleaned. Wash with warm soapy water, it can be rinsed through the swivel connection as well. Set to dry and if there happens to be any remaining moisture in the tube before therapy is started, connecting it to the CPAP with pressure can help to remove this. The mask may also be cleaned in the dishwasher once a week. The non-fabric parts can be washed on the top shelf of the dishwasher and air dried. Please refer to the instructions manual that came with the mask. What are the cushion sizes? Does it size the same as DreamWear under the nose nasal cushions? Does itt size the same as Amara View? DreamWear Full Face cushions come in four sizes: small, medium, large, and medium-wide. The full face cushion, whilst covering both the nose and mouth, is sized based on the nasal opening, just like the under-the-nose cushions. The nasal opening is the exact same design and shape as the DreamWear under the nose cushion which means, there is a direct correlation between DreamWear full face and DreamWear under-the-nose sizing – a medium in the full face is a medium in the nasal, etc. However, the DreamWear full face nasal opening is a different design and shape than the Amara View opening and the two masks size differently. Therefore, there is not a direct correlation between DreamWear full face and Amara View. How can you tell the difference between cushion and frame sizes? The cushion indicator is on the front of the cushion next to the arrow that points to the arrow on the frame for the connection. The frame size indicator is on the top of the frame behind the elbow connection. Why are there 2 exhalation ports? The split exhalation design enables the exhalation airflow to be dispersed and therefore isn’t as strong coming from just 1 exhalation port. What mask does this replace? 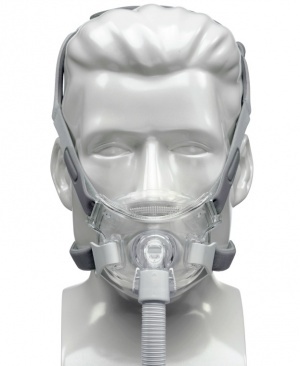 DreamWear Full Face is our premium full face mask offering. It is not intended to replace any Philips mask. 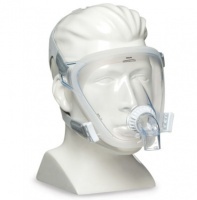 Minimalist full face mask with an innovative nasal cushion design. The Resmed Liberty was always one of my favourite masks this is like an AirFit version of it. Not the easiest mask to put on but worth the effort. I have thrown all of my other masks away! Diagnosed with OSA in March this year. After trying several masks I discovered Amara view which was good apart from needing mask liners which were expensive and not 100% effective. Recently in hospital for major surgery and while in ITU my O2sats were low overnight meaning having to have O2 administered via their C60 CPap which sounded like a jumbo jet engine. 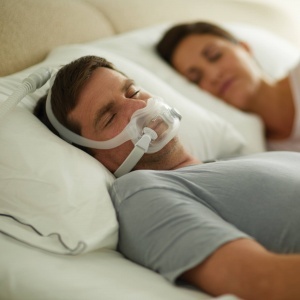 Suggested they contacted the sleep apnoea clinic for advice and discovered that O2 can be delivered with the new dreamwear full face mask as the hose had an optional O2 inlet valve. Still needing Xylimelts despite having humidifier but this mask is not as "drying". A wonderful discovery and fantastic to have a quiet nights sleep. Hope this review helps others. At first I struggled with the noise on the mask, but after getting a humidifier from my sleep clinic this resolved this issue. 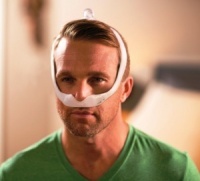 Also I wonder if I should have a nasal cushion as the mask does not fit as well as I would like under my nostrils. After wearing the dreamwear under the nose mask for 2 years. Found this “full face” dreamwear mask. This is absolutely the best, perfect when having a cold. I've only been diagnosed with OSA since March this year and only tried the full face mask issued by the hospital. It wasn't until I purchased the DreamWear Full Face Mask that I realised how unsuitable the other mask was for me. I no longer get leaks and have actually managed to sleep the whole night through on quite a few occasions, can't remember the last time that happened! The only down side for me is that this mask makes my mouth very dry so I have to use the Xylimelts. That said I would really recommend this mask. Thank you Hope2Sleep with all the help with the fitting. You're very welcome and glad you're as pleased as me with the new mask Louise. I'm not getting the dry mouth which the Amara View gave me, so if you don't have a humidifier then ask your clinic for one. Meanwhile, glad to hear the Xylimelts are helping too! I have been trialling this mask whilst waiting for stock and have been using both the FitLife and Amara View previously. When the Amara View came out I was very impressed, but I have to say that for me, this DreamWear Full Face suits me better. Sizing is crucial, as I found I needed the small mask frame with a medium cushion. I'm on a VPAP with a pressure of 24 and amazed at no leakage. Also, for some reason the Amara View gives me a dry mouth so I need to use the Xylimelts as well as my humidifier (even though I do like the mask), and this doesn't happen with the DreamWear. 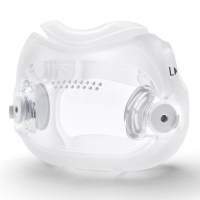 When I first used it, it was strange with the noise coming from the sides of my face, but after a few uses I don't even hear this now and the mask, when fitted correctly with the right size, is quiet. I absolutely love the fact the hose attaches at the top of the head instead of hanging below the mask. This gets a genuine 5 Stars from me personally, and I hope many other people get the same positive experience, as we don't kid ourselves that there's still no mask that suits everyone, but this definitely suits me!